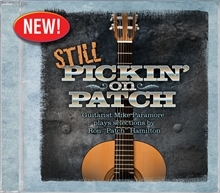 Mike Paramore has “picked” on Patch, done “more pickin’” on Patch, and is Still Pickin’ on Patch! If you like great fingerstyle guitar playing, you will thoroughly enjoy Mike’s unique, creative-style renderings of Patch the Pirate songs. Mike, a college professor, has a fabulous sense of humor which is portrayed through his music. You will not be disappointed!